Get Your Chopsticks Ready: Nobu's Coming to D.C.
D.C. is finally due to get some of the best sushi in the world. Los Angeles-based fine dining spot Nobu will be coming to the West End in fall 2016, according to a report by Washington Business Journal. 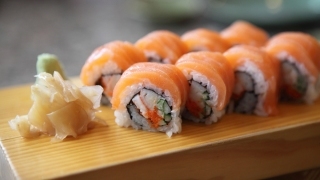 The famous sushi chain, founded by celebrated chef Nobuyuki Matsuhisa, actor Robert De Niro and former Hollywood producer Meir Teper, has more than 30 locations in the trendiest of cities around the world. Nobu's newest home at 2501 M St. NW will include two private patios overlooking Rock Creek Park, a sushi bar, a cocktail bar, a main dining room and two private dining rooms in over 11,000 square feet of space, WBJ reports. The $10 million project is part of a $93 million plan to convert the former American Association of Medical Colleges headquarters building into luxury condos; Nobu will take up the bottom floor of the complex, WBJ reports. The menu's unique blend of Japanese dishes with Peruvian ingredients present a combination so savory that people wait months for a reservation.